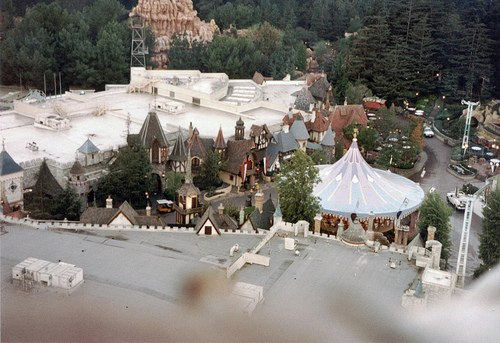 Today we have photos from the top of Disneyland’s Matterhorn. 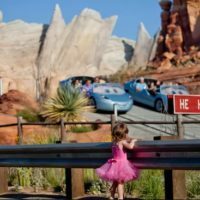 These photos come from a Disneyland Cast Member. Disneyland’s Matterhorn debuted in 1959 when the park’s first major expansion was completed. The Matterhorn, Disneyland Monorail, and Submarine Voyage all opened to the public on June 14, 1959. 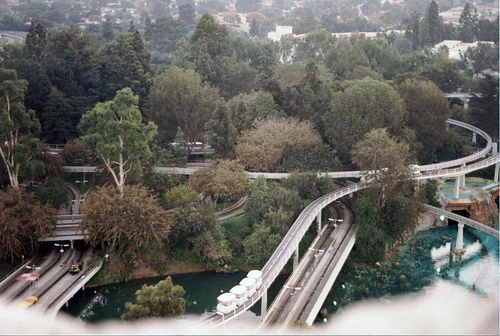 The Matterhorn Bobsleds were Disneyland’s first roller coaster type ride. 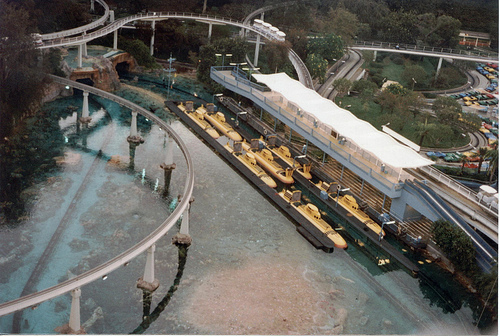 Because of the amazing theming and unique thrills, the attraction was the most popular in the park through the 60s and 70s. 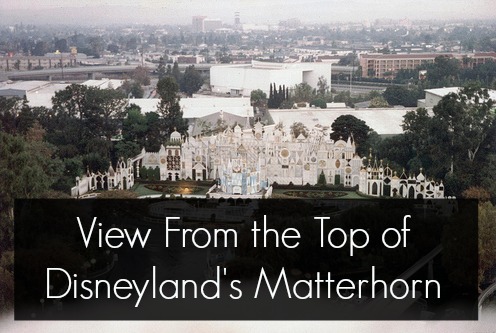 The Disneyland Matterhorn was built to 1/100th scale of the original Matterhorn, 147 feet versus 14.700 feet. The Matterhorn held the title of tallest structure at Disneyland until the Tower of Terror opened in 2004 clocking in at 183 feet. Since its opening in 1959, the Matterhorn Bobsleds attraction has carried more than 258 million Disneyland guests. Why the mysterious basketball court? Have you ever ridden the Matterhorn? 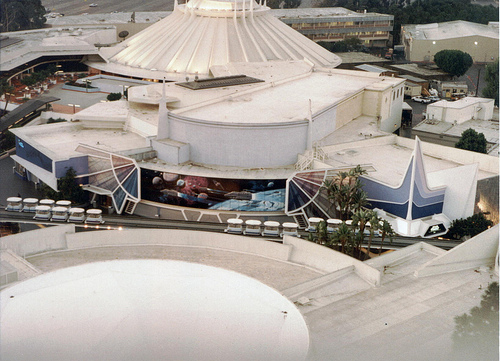 Since the time this photo was taken, the Disneyland PeopleMover has closed and now the track sits shuttered in Tomorrowland. Inside of the Matterhorn structure, the attraction only takes up the bottom two thirds of the mountain. The top one third was empty. There has always been a tradition to have Disneyland Cast Members climbing to the top of Matterhorn to wave to guests and occasionally play music. These mountain climbers are the only people to ever be in the top of the mountain (it is their break room), so Walt Disney asked them what they would like to have put up there. Long story short, they requested a basketball hoop. That’s it. No need for any huge rumors to spread about the reason that there is basketball hoop in the top of the Matterhorn. 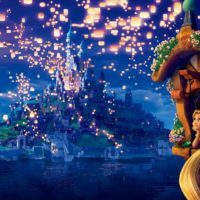 Love Disneyland Secrets? Click here. Disneyland’s Matterhorn is one of the most classic attraction at the parks. Riding the Disneyland Matterhorn bobsleds is a top priority every time that we visit Disneyland. 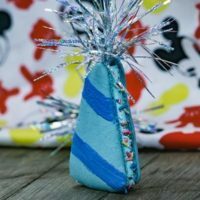 Be sure to join our newsletter for more Disney fun. Sign up here. If you enjoyed the article, please share it. It would be fun to have people guess what year these photos were taken. I don’t know the exact year, but I do know an approximate time frame due to certain attractions and areas that are depicted in the photos. It’s nice to see this from the early morning, and the streets are still wet from the steam cleaning that takes place overnight. Anyone have a guess ? Great pictures. I was just on the Matterhorn a couple weeks ago. Love it! 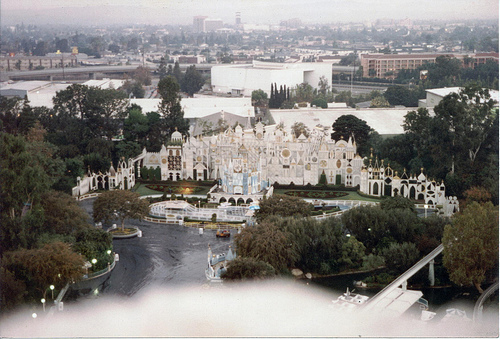 I really like that picture of it’s a small world with Anaheim in the background. It looks like a castle. Y’know, up until Indiana Jones was built, this was my favorite ride. But make no mistake, I still love it very much. 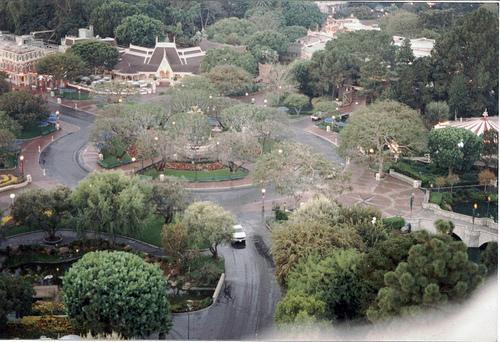 It is so cool to see the park from this high, especially when the people mover was in operation. I aprisiat by disney land & its fun rids..
…. so nice ….once enjoebal..